Elements, Elements and More Elements! 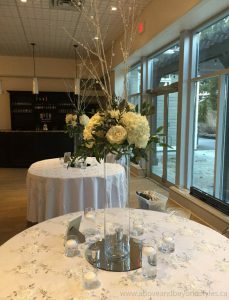 We will start by taking a look at these unbelievable centrepieces created by The Garden Gate Gifts and Florals out of Grand Bend, ON. 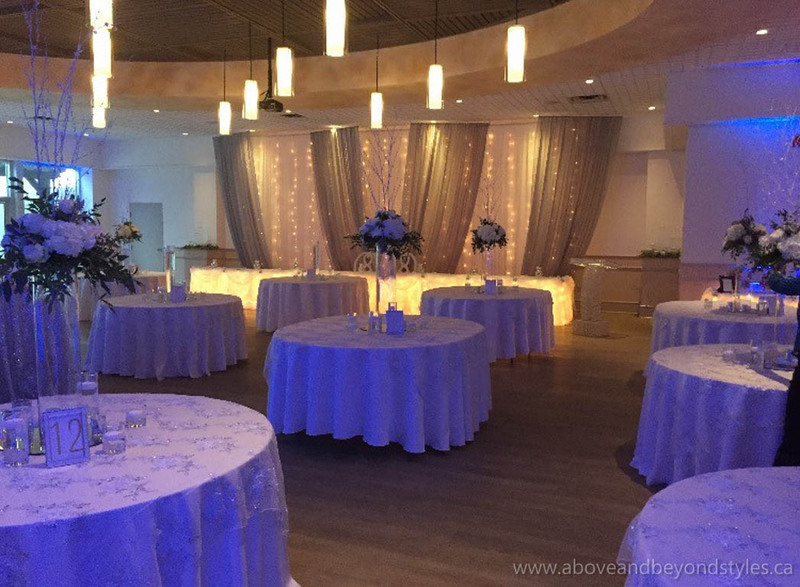 The sheer height is enough to draw your eye as soon as you enter the room, let alone the perfect mixture of fresh greens and white florals for the Winter Wonderland feel. Adding the crisp finish of the silver icicle twigs to the top and voila, you have your stunning dream centrepiece. And what did I say before? The small details matter! So obviously adding in the smaller candlescaping surrounding the bottom of the vase with the base mirror are the simple final touches to accent this masterpiece. The main element is always the spectacular head table’s backdrop, and we didn’t disappoint! Our Ceiling Swag Backdrop with charcoal and white sheer, illuminated with cascade lighting is the perfect choice to showcase our gracious and elegant bride. 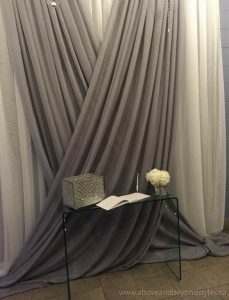 The head table is dressed in an illuminated elegant sheer with organza top edge that adds an icy look for the Winter Wonderland, and of course the accenting pro wraps along the top edge to make the silver POP! 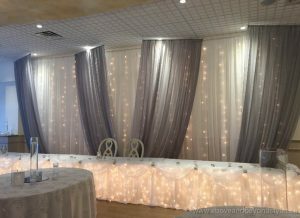 There are so many amazing elements that go into creating a couple’s dream wedding: the backdrop, centrepieces and accents are only a few. We couldn’t have been happier with this Winter Wonderland. Kelly & Kyle I hope you were as blown away as we were with how wonderfully it all came together for your happily ever after!